I prepare an egg-oil emulsion using the egg shell itself as a measuring device. I break one whole egg into a container. To that, I add one half egg shell of cold-pressed linseed oil, one half egg shell of damar varnish, and two half egg shells of distilled water. This sequence must be followed if the emulsion is to mix properly. This mixture becomes a painting medium to which I will later add pigment. It can be stored in the refrigerator for up to three weeks. To create a range of cool pinks for painting the highlights, I mix together varying amounts of Indian red water color paint, Daniel Smith's titanium white dry pigment, and distilled water to get a solution that is the consistency of tube oil paint. To store indefinitely, put paint in jars and cover it with distilled water. On a plastic plate I then add a couple drops of the egg-oil emulsion to a small amount (the size of a pencil's eraser) of the pink we have created. Add distilled water to change the paint to the consistency of skim milk. The color is now ready to apply to the canvas. This egg-oil paint is used in combination with traditional oil colors because I can achieve the appropriate visual effects by painting one into or over the other. 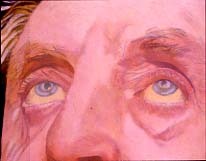 For example, I can achieve sparkling highlights in the skin tones by painting the pink egg-oil emulsion into Naples yellow oil color. Applying the tempera in this manner assures its permanency. As you model or build up the tempera it increases its radiance. Each layer is both subtle and powerful. Try it, you will see what I mean.